Beyond the Red Mirror features three orchestras and three separate choirs. Let that sink in for a moment, and then realise that this is not the long-mooted “orchestra project” Guardian has been working on for years. It’s the tenth regular album and the first in a tantalizing five years. It also has the potential to be the absolute best thing the band has ever put out, although it’s not an album for everyone, and therein lies the biggest problem: it might be too much for some people. The first time I listened to the album integrally, none of it clicked. I was dumbfounded by the bombast – which is saying something, as Blind Guardian has always reveled in it – and the sheer abundance of sounds. There is so much crammed into these eleven songs  that it becomes impossible to digest all of it properly on your first try. Or your second. Or your tenth. Beyond the Red Mirror is an album that takes a ridiculous amount of time to gestate, which is one of the reasons this review has taken me so long to write. This is not your father’s Blind Guardian. This is not the same band who released Imaginations from the Other Side or Somewhere Far Beyond back in the day. This is an entirely different beast. Beyond the Red Mirror is bookended by The Ninth Wave and Grand Parade, two songs clocking in at precisely nine minutes and twenty-eight seconds each. That should give you an inkling as to how meticulous this album is constructed. The former is a grandiose and brooding opener with its Gregorian choirs and subtle ramping up of orchestration, and the latter is described by the band as ‘the best song we’ve ever recorded.’ More on that later. In between those two bookends, you’ll find the most consistent and downright heavy album on this side of 1995’s Imaginations From the Other Side, with everything you have come to love from Blind Guardian dialed up to eleven. The band has never sounded this massive before, and at times it feels as if the medium is barely able to contain all of it. Of course, you have your speedy neck-breakers like The Holy Grail and relatively run-of-the-mill Guardian songs like Twilight of the Gods and Sacred Mind, but they are all enhanced by orchestration, top-level musicianship and a craftsmanship of a band on the absolute top of their game. It’s Blind Guardian 2.0, if you want to attach a moniker to it. The diversity of the material is staggering as well. Between what would otherwise be a number of fairly typical Blind Guardian songs, we also find finely honed gems like Prophecies, which is dark and rather heavy, or the over-the-top orchestral At the Edge of Time, which sweeps and swerves and swells and can never be done justice on a live stage without a real orchestra. Miracle Machine is your Queen-esque ballad, and Grand Parade is every bit as majestic as you would expect from the title. Never has the band sounded so big as on this song, which is for a large part due to the orchestration. Grand Parade is absolutely huge in its delivery, and could very well replace And Then There Was Silence as the most majestic, multi-layered thing the band has ever released. It’s an absolutely phenomenal closer to a brilliant album. It also begs for a re-recording of And Then There Was Silence with proper orchestration. The biggest – and arguably only – problem with Beyond the Red Mirror is the production, which suffers tremendously on sub-standard equipment, as if they had trouble containing both Guardian’s complex brand of metal and a choir and an orchestra. As a result, the album sounds compressed, contained and ultimately too flat on an average stereo set. Play it on a good set of speakers, and it’s a world of change. It is a small gripe for some, but can be a definite turn-off for others, so beware. In the end, however, Beyond the Red Mirror is a triumph. 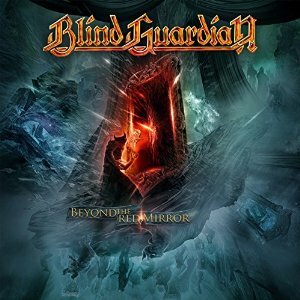 It’s full of those big, soaring choirs and jubilant guitars you have come to know and love by Blind Guardian, and it is easily the best album they have released since Somewhere Far Beyond from 1992 (! ), which is an amazing feat for a band which has been at it for nearly thirty years. Time will tell if it will be their definitive magnum opus, but for now, it’s the absolute best you can get in terms of power metal. 1. It should be noted that I have included the bonus track Distant Memories in the track listing below, since it is placed between the regular songs on the limited editions and vinyl versions of Beyond the Red Mirror, and serves as both an integral part in the conceptual narrative and a well-deserved breather amongst all the ostentatious bombast. This entry was posted in Uncategorized and tagged Andre Olbrich, Beyond the Red Mirror, Blind Guardian, Hansi Kürsch, Krefeld, Markus Siepen, Metal, Nuclear Blast, power metal, review. Bookmark the permalink.